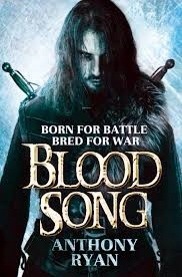 Book one in the Raven’s Shadow trilogy, Ryan’s Blood Song is epic fantasy at its finest. Introduced to the protagonist Vaelin Al Sorna when he is a child, the first part of the novel focuses on his journey from boy to man, from a lonely child to a feared warrior. His training by the Sixth Order is brutal, teaching and forging Vaelin into a powerful instrument of war. Along with his band of brothers, Vaelin undertakes numerous challenges as each year passes, whittling out the weak and leaving only those skilled enough to survive the hardships and harsh tests. However, the book quietly builds as intrigue and mystery begin to insinuate themselves into the story. Vaelin’s life is threatened and a number of times he thwarts attacks against his fellow Faithful. In his final exam, a test of his martial skills fighting three criminals to the death, Vaelin realises he has killed an innocent man. Embroiled now in a web of deceit and political intrigue which pits his place in the Order against the King of the Realm, Vaelin’s infamy and legend grows with each battle. Before long Vaelin is commanding a company of men, sent on a mission designed to cause war. It is here that the true character of Vaelin becomes clear, as all the losses and lessons that have made the man coalesce. As the novel draws to a close, the plot rises to an uncertain crescendo echoing the title of the book. Ryan’s skill in telling the tale, using the ending as the beginning and focusing on Vaelin makes for a wonderful, fluid read. As each new intrigue is added the book builds and builds, driven first by the characters and then by the stunning and gripping action. The author has created a fantastic world of fractious nations, civilisations and religions. It’s a brilliant backdrop to Vaelin and his brothers in the Faith and their adventures. But, it’s the depth of the book and how Ryan allows certain elements, such as the curious and fascinating notion of magic, to rise up out of the story that makes it such an absorbing read. Thankfully the second in the series, Tower Lord is already out and I can’t wait to read it. In short, Anthony Ryan is highly recommended.